Philadelphia’s NBC O&O WCAU-TV has taken the wraps off its top-secret new set and graphics package. The new set, designed by Clickspring Design, features a unique layout with a modern, clean look accented with warmer more traditional surfaces. The new set is designed to complement the station’s weather center, which was replaced a few years ago by BDI. One of the highlights of the new set is the anchor desk, which seems to be supported only by glass. Despite this, the anchors still have access to in-desk monitors. We do wonder, however, where the anchors hide their mirrors, coffee mugs and other odds and ends found behind most studio sets. One unusual feature of the anchor are is the diagonal stripes on the riser. These are a bit odd and almost seem like yellow and black striped warning labels. Off to one side of the anchor is a glowing rectangular box encased in a glass surround and emblazoned with the NBC 10 logo, while the main anchor background is a duotone duratran that changes color along with the rest of the studio’s lighted surfaces. The anchor area’s layout is very unique in that it doesn’t follow the normal symmetrical configuration, which allows for a unique combination of two-shots and one-shots. The duratran is fronted by a etched glass panels, which add a nice layered effect while also incorporating an abstract arrangement of the NBC peacock. Above this is a metal framed header and double-height walls that add additional interest. 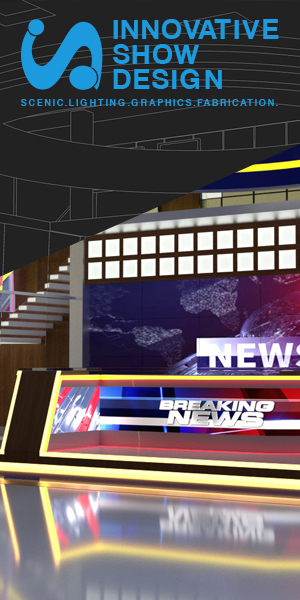 The anchor area’s sharply angled walls also allow for it to be used as a standup area that incorporates an LCD screen and larger monitor built into the wall. The set also includes faux stone and wood finishes, which help keep the studio from feeling too cold and impersonal. The far left of the studio features a monitor wall that’s used for standups. NBC 10’s new look does have a few downsides. One is that the selection of surfaces and set components seem a bit mismatched. Some of the elements don’t transition well, such as the stone column that seems to be plunked down in the middle of the studio without any reason or thought; it doesn’t even appear to be supporting anything. In addition to the new set, WCAU-TV has a new graphics package, similar to the one being used at other NBC O&Os.